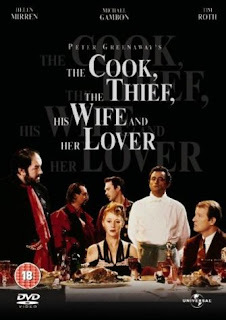 One film that is hard to forget is the 1989 dark comedy, The Cook, the Thief, His Wife & Her Lover, written and directed by Peter Greenaway and starring, among others, the outstanding actress Helen Mirren, and the amazing Tim Roth (Reservoir Dogs). The film's title popped into my head as I was thinking of the heinous Heidi Diaz/Kimmer this morning, picturing her rubbing her hands together in glee as mountains of cheques, bank and credit-card payments started pouring in from unsuspecting people who had signed up to her dangerous Kimkins starvation diet plan after Christmas and New Year's. That thought just horrifies me. And what is just as horrifying, given her penchant for thievery, is what she may do with the influx of credit card numbers and bank card/account numbers. Trust me on this...Heidi Diaz/Kimmer is not beyond identity theft. 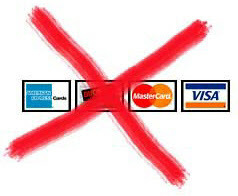 So please warn one and all not to provide the Kimkins website with any credit/bank card numbers or personal cheques. I've never seen that movie, but I sure like the title! With the things known about this woman already, and the allegations that are about to be proven, can you imagine how desperate she must be feeling? And what actions she'd be willing to stoop to while in that state? OYB, thanks for your comment! The movie is tres decadent and bizarre (right up my alley!). I'm sure Heidi is holed up in her new hot tub, dodging shrapnel these days. It's about time she felt as desperate as those poor dieters who continue to follow her deadly Kimkins diet. Hopefully, the New Year will finally find her behind bars in the Big House. OYB, yes I remember that Andy Griffith episode. 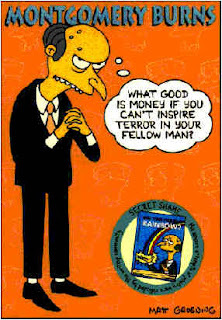 Gotta love that Barney.